Ten-year-old Keeper believes in wishes and magic, and why shouldn’t she? Her mother, gone for the last seven years, is a mermaid, after all! So on the day of the Blue Moon, when everything she does has a disastrous result, Keeper knows her only option is to row out past the sandbar to the treacherous open water of the Gulf of Mexico, accompanied by BD (Best Dog) and Captain the seagull, and hope her mermaid mama can tell her how to fix things…. Filled with love, wild adventure, family drama, and even a touch of true fantasy, this is a deeply satisfying tale. Please add your comments about October’s pick here! Also, we need your recommendations for future book club selections. Please fill out this simple form to let us know the best new books you’ve read this year, especially titles you have a hunch will show up on Newbery, Printz, or other major award shortlists. 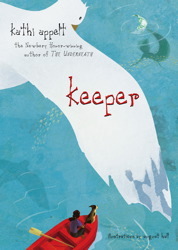 This entry was posted in Book Club and tagged appelt, Book Club, keeper. Bookmark the permalink.